This meal was for Mr G&J’s birthday and his comment on finding out the venue was, ‘this has become less like celebrating each other’s birthdays and more like a game of one-upmanship.’ That’s how far I smashed it out of the park with getting a table at this restaurant Dear Reader. L’Atelier de Joel Robuchon is hidden down an alley, lit only by the red L’Atelier sign outside. You enter into a spacious waiting area with a lounge and a small balcony where you can view the dessert chefs at work. The ground floor of the restaurant is mostly counter dining style and on the second floor (accessible by lift or stairs) is a bar area with huge comfy sofas and a bijou terrace where you can recline under heat lamps and blankets (when needed in the British ‘summer’) and enjoy a drink. This is where we were guided to first, as our table was about 15 minutes from being ready. 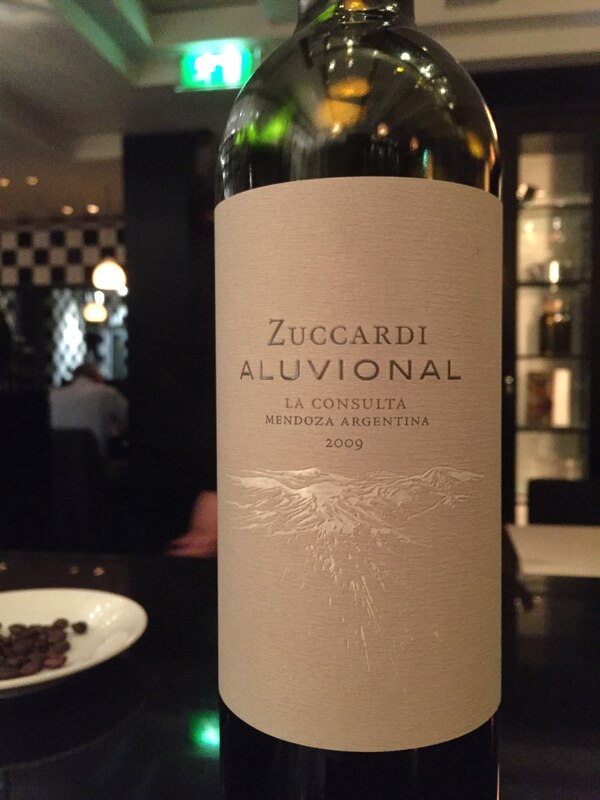 We’re not a couple who turns down a drink, so we settled in on the terrace and ordered two glasses of very tasty Malbec. The maitre’d came to fetch us when our table was ready and when we went back down to ground level. 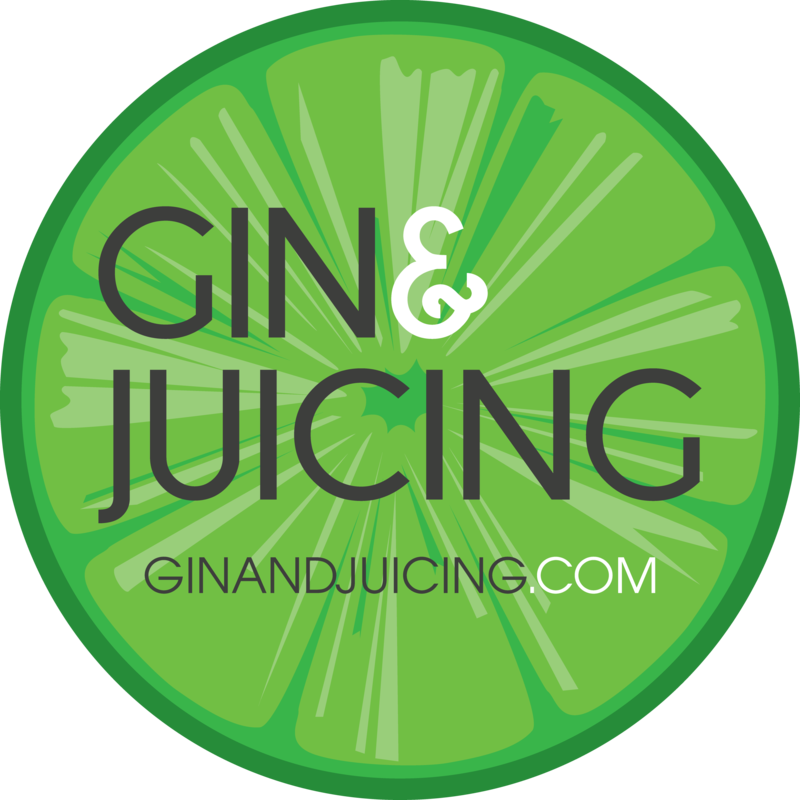 I was delighted to find that my booking had been changed from the counter dining style that I had booked (I booked months in advance and this was all I could get, this is how popular this place is) to the seated restaurant, which occupies level one. Back up in the lift and we were shown the best table in the house, right next to the open kitchen where we could watch the army of chefs preparing the exquisite menu. I was beyond delighted, I am smiling as I write this, it was wonderful to be treated so well. And so this set the tone for the night. The staff were friendly, warm and clearly very happy in their work as well as being unobtrusive, a difficult balance to strike. The atmosphere is very relaxed yet refined and the whole experience makes you feel incredibly welcomed and extraordinarily privileged to experience such a gorgeous restaurant as L’Atelier de Joel Robuchon. I’ll stop waffling now and get to the drinks. 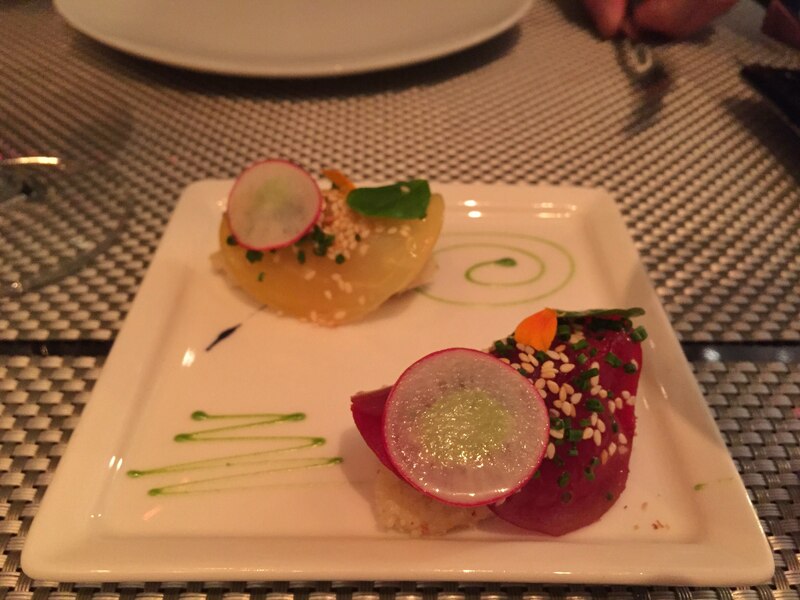 This dish is a fabulous introduction to the creativity that fuels this restaurant. The sushi is made from riced cauliflower and topped with glowing disks of beetroot, micro herbs, sesame seeds and the first appearance of edible flowers, which will become a theme throughout the meal. The only way to describe this dish is absolutely and utterly delicious. I honestly never knew that cauliflower could taste that good and the texture is completely convincing as sushi rice, if not slightly lighter. 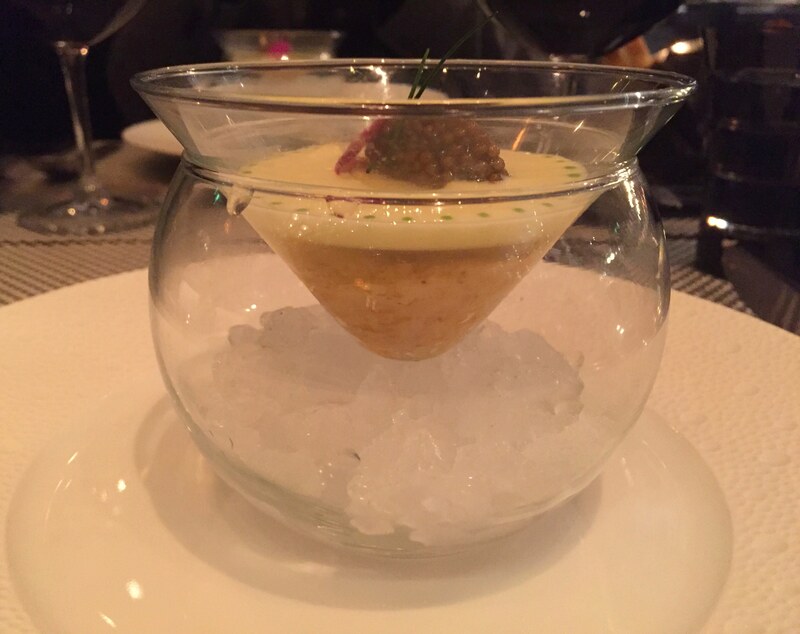 Quite possibly one of the most impressively plated dishes I’ve ever seen; the crab royale is suspended in an inverted triangle dish which floats above ice to keep it cool. The vichyssoises was smooth and creamy, which is a perfect foil to the delicately sweet crab. 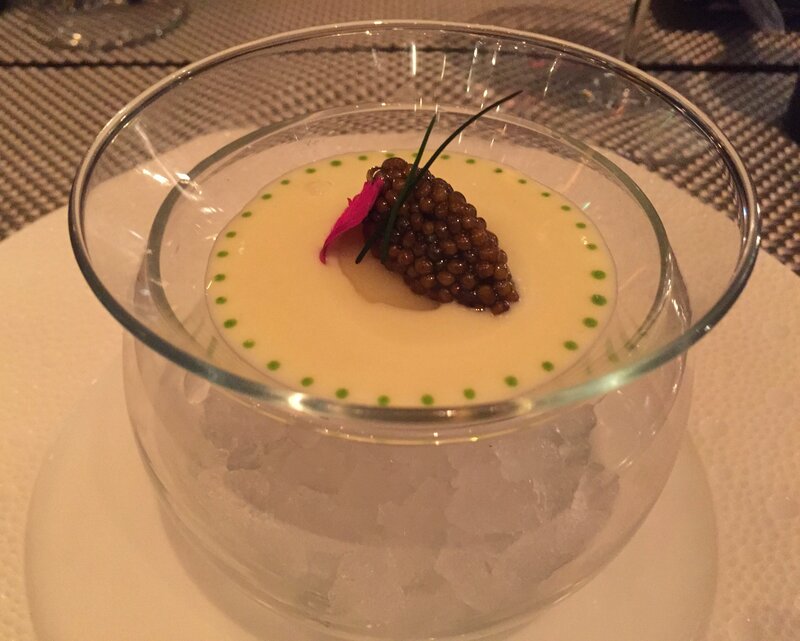 The caviar topping sings out beautifully from the dish, providing a salty foil to the other ingredients. Lux plus. SCREAM OMG, THIS IS THE POSHEST MAC AND CHEESE EVER. This was so incredible I had to be physically restrained from licking the plate. The silkiest pasta wrapped around artichokes and morel mushrooms which were so robust and earthy that you’d swear you were eating some excellent beef. Topped with gorgeous, gooey Comté, this was like being hugged from the inside out. Look at the way this dish is presented Dear Reader. How beautiful is that? 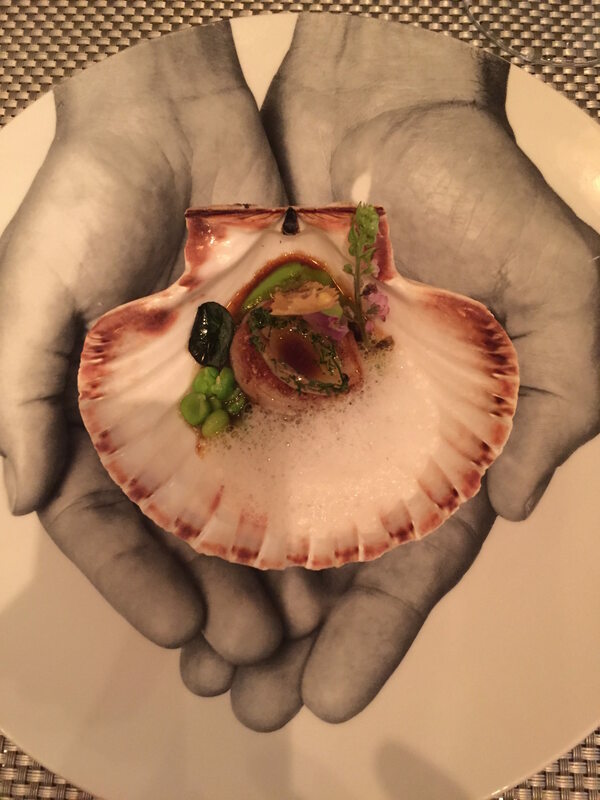 The restaurant is offering you a little gift, palms outstretched, cradling a beautifully seared scallop, cushioned in pea mousseline, foam and edible flowers (which were delicious by the way, I wish I knew what they were), served in its shell. The dish was crowned with very delicately grilled shallot, which added a pleasant earthy contrast to the delicate scallop meat. I love hot foie gras, the way there’s a slight caramelisation on the outside and then on the inside it’s all buttery and melty. 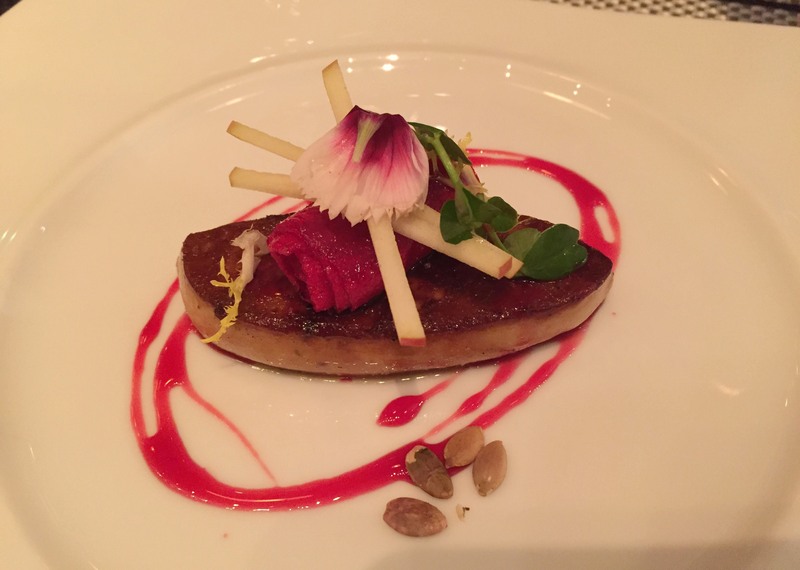 This is a brilliant rendition of this dish, the sweet hibiscus bringing out all the savoury umami notes of the foie gras and the tart green apple providing crunch and texture. So good. I’m a massive fan of black cod, it has the most silken delicate texture and it lends itself so well to use in Asian dishes. 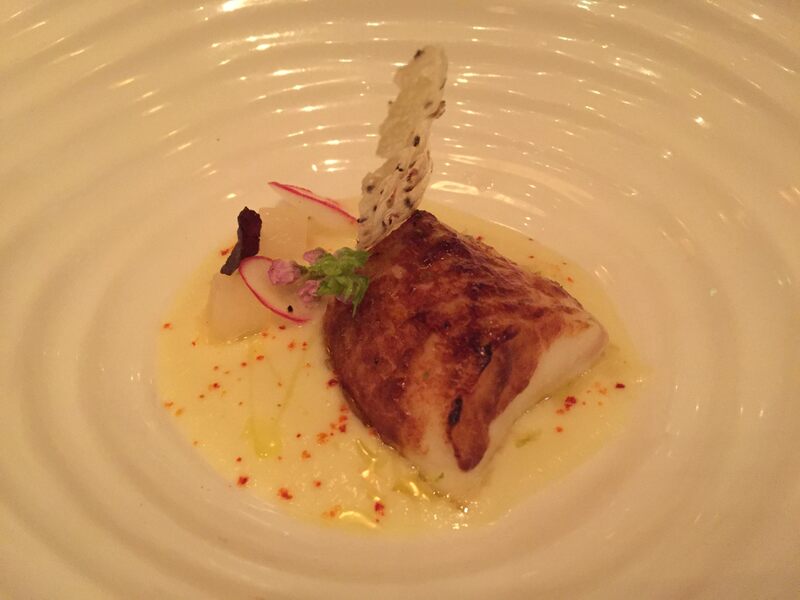 This dish was very skillfully balanced with the daikon radish puree humming in the background, the miso glaze on the black cod providing contrast to its sweet flesh and the yuzu providing the final tangy notes. More foie gras! Yay! 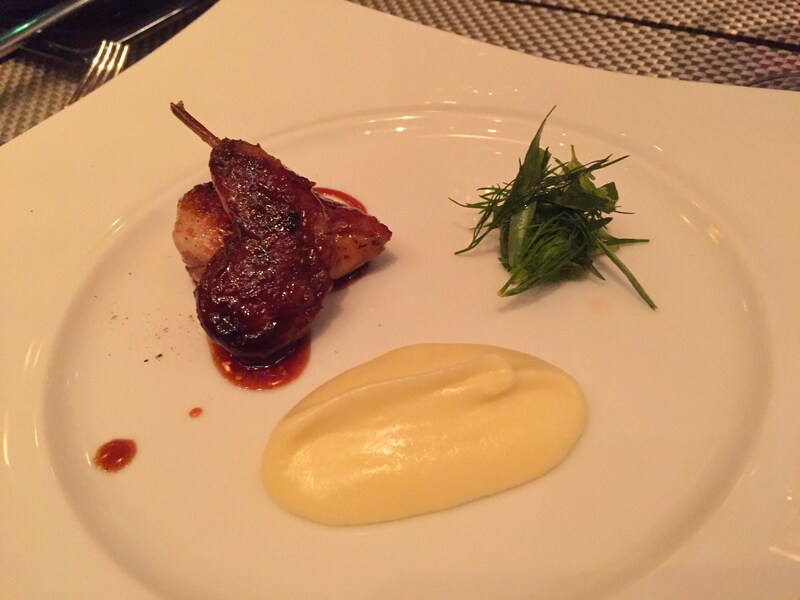 Here the foie gras was stuffed in the tiny and beautifully cooked quail and matched with herb salad and truffle mash. The waiter very kindly brought us a whole bowl full of the silky truffle mash to add to our plates, which we were thankful for as it was so incredibly moreish. This was a masterful way to end the savoury part of this meal. Of all the fruits, mango is one of my absolute favourites so I was bound to love this dish. 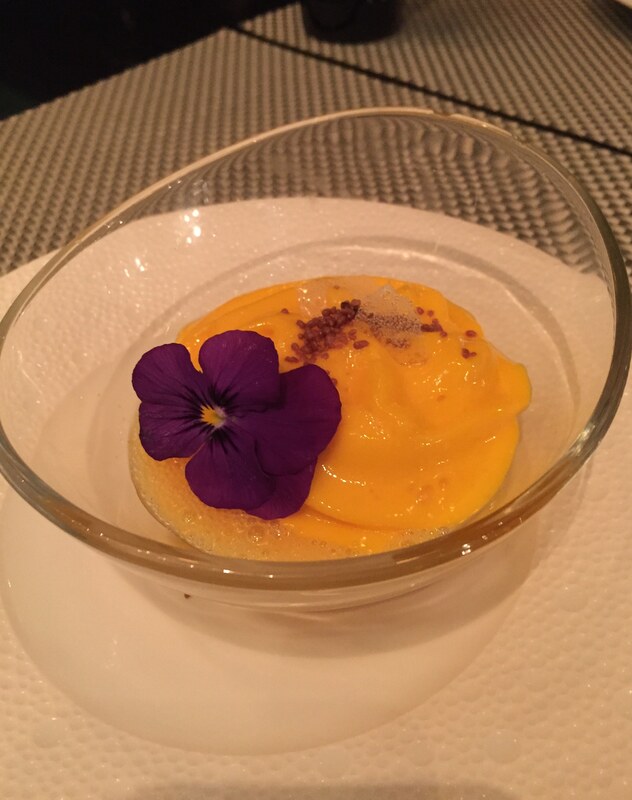 This dish was a study in texture and contrast between the sweet mango, tangy passionate sorbet and the popping candy. I loved the popping candy as it lent a playful element, a reminder that food should be fun as well as delicious. The biggest surprise for me was the candied macadamia sitting down at the bottom of the bowl, its crunch and sandy texture balanced this dish so perfectly. The finale! And what a beauty it was. 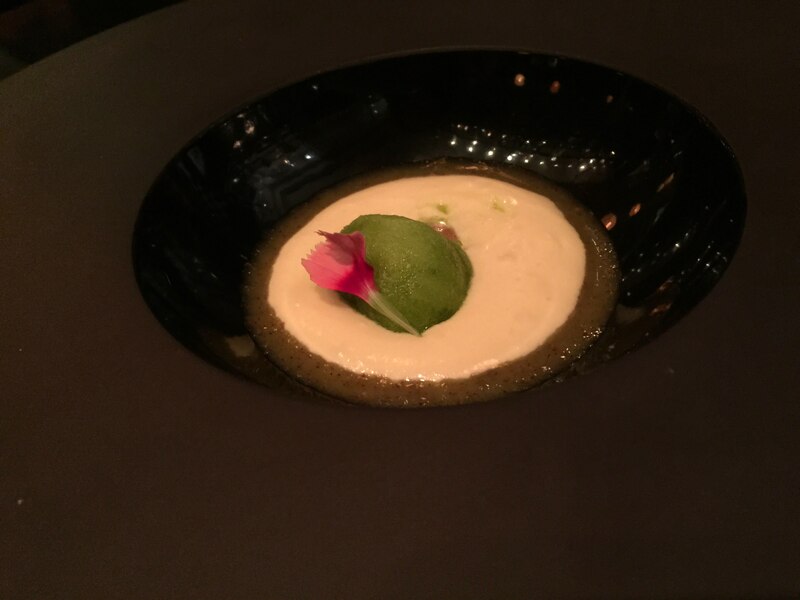 Impressively presented on a colossal matt black dish, the sorbet and chartreuse cream looked like a planet suspended in a dark sky. This was a very delicate and soothing dish, a subtle end to a very impressive and complex meal. It didn’t end there Dear Reader, we were treated to further delights. Despite the nine courses we weren’t uncomfortably full, mainly because each dish was so thoughtfully balanced and the service was set at a pace that was respectful to each course. Next came a birthday plate for Mr G&J, set with various treats (unfortunately we demolished it before I got a picture). Very sweetly, the waiting staff, chefs and friendly Americans seated next to us all sang Happy Birthday to him. Then came the plate of petit fours, including miniature friands and house made marshmallow squares. We left L’Atelier de Joel Robuchon very happy, rather full and very much looking forward to our next visit to explore the culinary expertise of this most excellent restaurant. 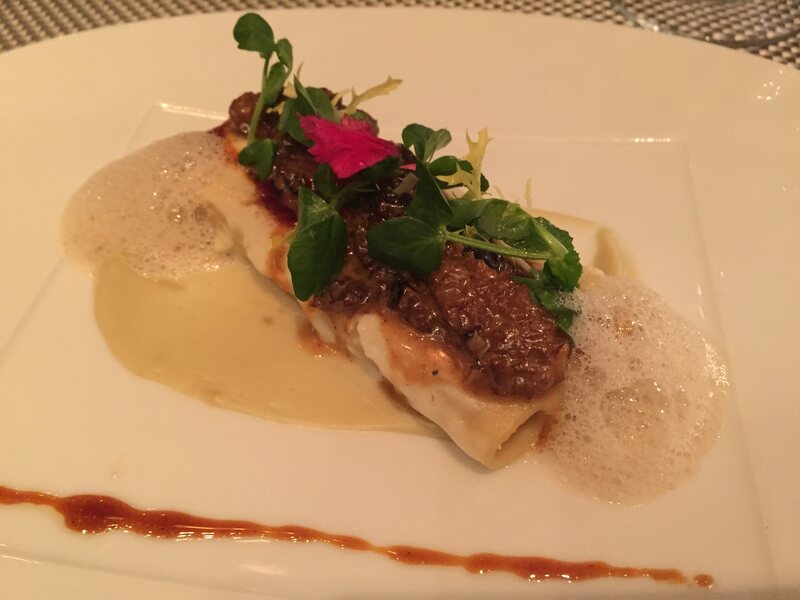 If you ever get the chance, then get a table booked and go, L’Atelier de Joel Robuchon really is that good.